Pest description and crop damage True (common) armyworm (Mythimna unipuncta, formerly Pseudoletia unipuncta) and variegated cutworm (Peridroma saucia) are the most common species in western Oregon. They present from early bloom through seed set. 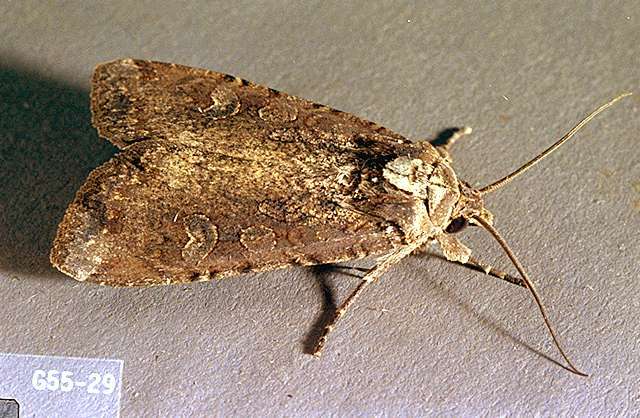 Moths in the family Noctuiidae have gray or brown forewings with slate or buff-color markings. Hind wings are silvery-gray or beige. Average wingspan is 1.4 to 1.6 inches. Mature larvae are about 1.5 to 2 inches long, tan to brown, with a faint white or red midline stripe on the top of the body. These are bordered below by a white stripe on each side. A prominent black stripe is along each side bordered below by an orange-brown stripe. Larvae have an inverted white Y on the front of the head. Pupae are brownish-red and found in the top soil layer, commonly near the crowns of host plants. 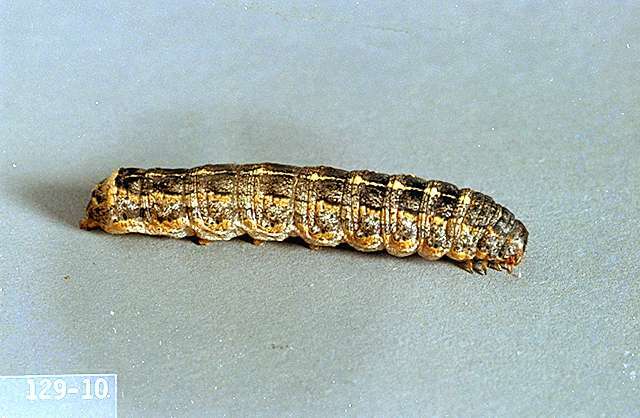 Winter cutworms (Noctua pronuba) have been recently detected in clover seed fields in western Oregon but significant damage has not been recorded. Scouting and thresholds Look for armyworm and cutworm larvae in and around crowns, where birds (swallows, crows) are feeding. Dig around in crop residue and at the base of plants. Armyworms and cutworms typically feed at night. Also look for frass (excrement) that resembles tiny grass pellets. Treatment in established clover seed crops is suggested when 4 larvae per sq ft are observed. The threshold in seedling stands is 2 larvae per sq ft. Populations of noctuid moths are generally kept under control by a number of natural enemies that include parasitic wasps (Trichogramma species and braconid wasps), parasitic flies in the family Tachinidae, nematodes and several bacterial and viral pathogens. Natural predators will feed on cutworms readily, including predaceous ground beetles, birds and rodents. However, the impact of these natural predators on cutworm populations in Pacific Northwest production systems is unclear. Bacillus thuringiensis (Bt)-Use according to label directions. 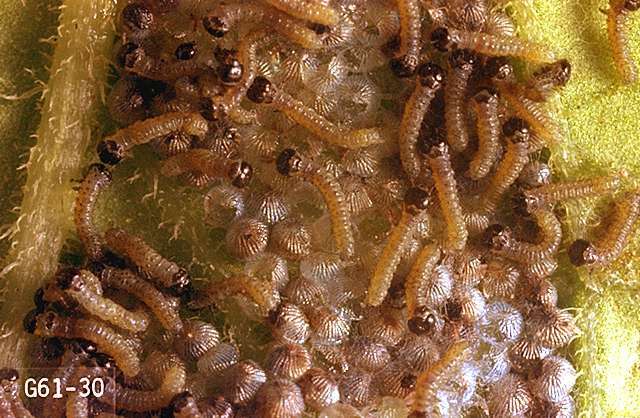 For armyworms, effective only on first and second instar larvae. Some formulations are OMRI-listed for organic use. chlorpyrifos (Lorsban Advanced) at 1.0 lb ai/a. REI 24 hr. For best control, soil should be moist and cutworms active on or near the soil surface at treatment. This product is highly toxic to bees. Do not apply when any clover bloom is present. Do not make more than one application per crop year. Do not graze clover after application. Do not cut treated clover for hay or forage. Do not use harvested seed for sprouting. No part of the treated field, including seed, seed screenings, hay, forage, or stubble, may be used for human or animal feed. Processed seed must be labeled. 24c SLN: OR-090010. Oregon only. malathion at 1 to 1.25 lb ai/a. PHI 0 days. REI 12 hr. Use higher rate for armyworm control. Apply to plants in bloom only in evening or early morning when bees are not working in the fields or are not hanging on the outside of the hives.